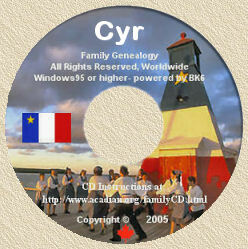 Home of Acadian-Cajun & French-Canadian Family Surnames, Genealogy CDS, Family Crests and Historical Information resources... since 1991. Beginning in 1755, thousands of settlers were deported from their native Acadia (Nova Scotia) to the British colonies of North America. To mark the 250th anniversary of the deportation, Canada Post issued a single domestic rate (50¢) commemorative stamp on August 15, 2005, Acadian National Day. This is the second time Canada has commemorated the Acadian deportation with a stamp. In 1930, the "Grand-Pré" stamp was issued to mark its 175th anniversary. Danielle Trottier, Manager, Stamp Design and Production at Canada Post, says the Stamp Advisory Committee proposed the "stamp on stamp" concept for the issue. "This was such a significant event in Canadian history, and particularly for the Acadian community. We felt it would be fitting to showcase our previous commemorative stamp in the new issue. Coincidentally, both stamps  from then and now  bear the 50-cent rate." Canada Post commissioned graphic artist Pierre-Yves Pelletier for the stamp design. A "seasoned pro" with 110 stamps to his credit, Pelletier, of Belil, Quebec, was excited and challenged by the project. "The Acadian community, naturally, is sensitive to its past and I wanted to pay tribute to their heritage and to what they have been through." The original "Grand-Pré" stamp portrays the famous statue of Evangeline and the Acadian chapel at Grand-Pré National Historic Site. Pelletier scanned the mint condition 1930 stamp and illustrated the Acadian flag in motion. A backdrop of waves, in a five per cent screen, represents the sea voyage. "For me, the flag is the symbol and this is what I focused on," explains Pelletier. The Acadian flag was established at the Second Acadian Convention in 1884. It is a French flag - tricolour blue, white, and red - with a gold star at the top left. The star, Stella Maris, is the star of the sea and symbolizes the wanderings of the Acadians through the storms and dangers of life. "It was important to keep the design simple and clean. The colourful flag works well with the dark blue of the old stamp and its perforated edges. The waves are in a very light screen so as not to detract from the main element, which is the flag. The stamp on stamp was a good idea for this issue." Hi - I am a Nova Scotian, genealogist, and stamp collector and noted your reference to: Acadian Deportation 1755-2005 Article published in Canada's Stamp Details (Vol. XIV No 3; July to September 2005).